My wallet is open. Just, seriously, just take my money—just the ¥3,800 (US$48) necessary to buy this Legend of Zelda Link figure. Going on sale this October in Japan, this Link figure is the latest in the Figma action figure line. 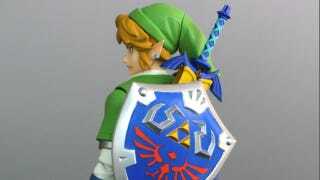 This Skyward Sword Link is fully poseable and comes with a Master Sword and two facial expressions as well as the ability to take people's money. Check out more images in the gallery.